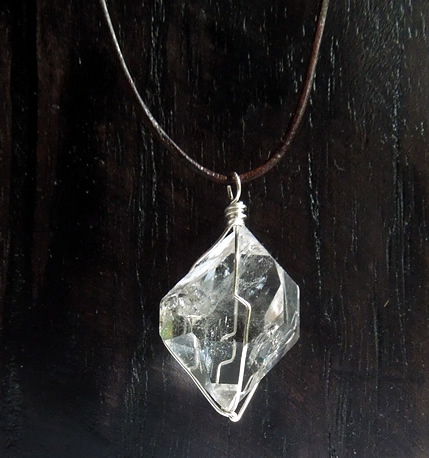 Notes: A large round, or gumball shaped Herkimer crystal with sharp double termination points makes a statement as a pendant. 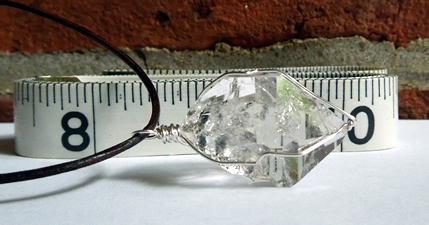 It measures 29x21x16.5 mm / 51 ct.
A clear inclusion near bottom tip sparkles rainbows. Wispy inclusion is present as well and really reflected in the pictures. Clarity is excellent. Externally the back of the pendant has a black hydrocarbon growth occurrence, giving it a smoky hue. A well defined key is near here as well. All other facets are clean and smooth. 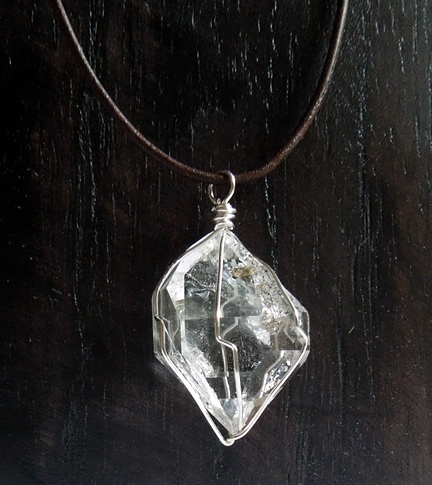 The Herkimer is wrapped securely in Sterling Silver and suspends from an adjustable brown faux leather cord. Suitable for men or women.